As a blogger, I get to try out tons of makeup products that way I can fill you ladies in on what's new and what products work for me. 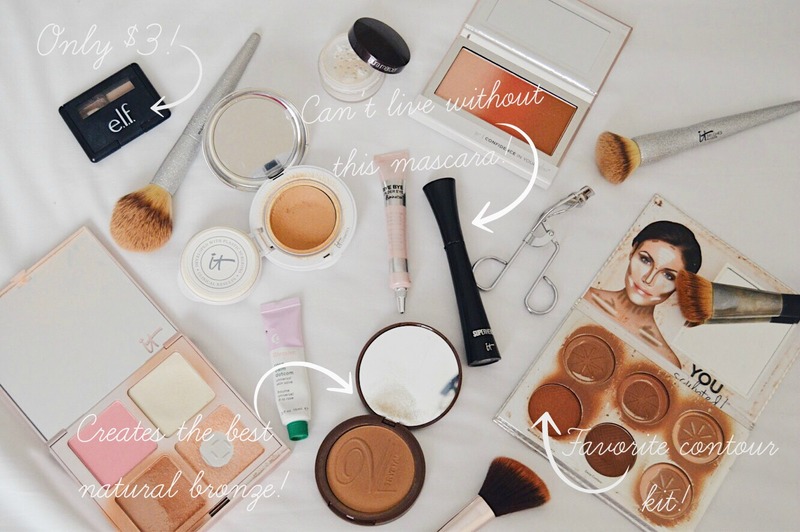 I have tried countless foundations, concealers and mascaras, but only a few of them make the cut for my everyday makeup routine. In today's post you will find out my tried and true products that I honestly use and love for my everyday makeup routine and how I apply them. Enjoy! 1.) First I apply the Confidence in a Compact foundation in the shade medium tan all over my face with a foundation brush. This foundation offers great coverage and lasts all day long. 2.) Next I apply this pressed self tanning bronzer from Vita Liberata on the high points of my face (cheekbones, forehead, nose etc.) for a natural sun kissed look. 3.) Then under my eyes I apply the Bye Bye Under Eye concealer in the shade light (this stuff is amazing and full coverage!) and I blend it with my finger and then I set it with the Laura Mercier Secret Brightening Powder. 4.) After that, I use this kit from Elf in the light shade and I fill in my eyebrows. This kit is super affordable and I actually love it more than some high end brow kits that I have tried. 5.) Next I use this contour kit and I contour and highlight my cheekbones. As you can tell by the photo above I have used this kit a lot and am in need of a new one soon! 6.) For blush, I simply sweep the Confidence in your Glow in the shade warm on my cheeks and I top it with the highlighter from the Je Ne Sais Quoi palette. This blush and highlighter combo makes for the prettiest natural looking glow. 7.) After that, I curl my lashes and apply two coats of the Superhero mascara from It Cosmetics. I cannot live without this mascara, it takes my lashes to a whole new level. 8.) I then finish off the look with a swipe of the Balm Dot Com salve from Glossier in the rose flavor on my lips. This stuff is super hydrating and has a subtle pink tint to it for a little pop of color.